Sometimes our days can be gray and gloomy, and life can seem like an unending rickety roller coaster ride we just want to disembark, and it’s these times that require us to unearth any techniques we can that happen to bring peace, hope and joy into our days. Our hearts go out to the folks in Brussels, indeed, to anyone that is suffering unduly and we hope that this week’s remedies might make you smile, smirk, raise an eyebrow or inspire you to share your own good happiness Rx prescriptions. Being of a slightly melancholy and skeptical frame of mind these days, my hope and joy seem fragile and elusive, like skinny waifs in need of a Big Mac. So when I think about unearthing techniques to help me bring a heartier version of joy and hope into my space, it feels slightly impossible. But what I’ve come to realize is that no one is going to hand me hope, and if it seems fragile that’s because I’m depriving it of the light and nourishment it needs to grow. 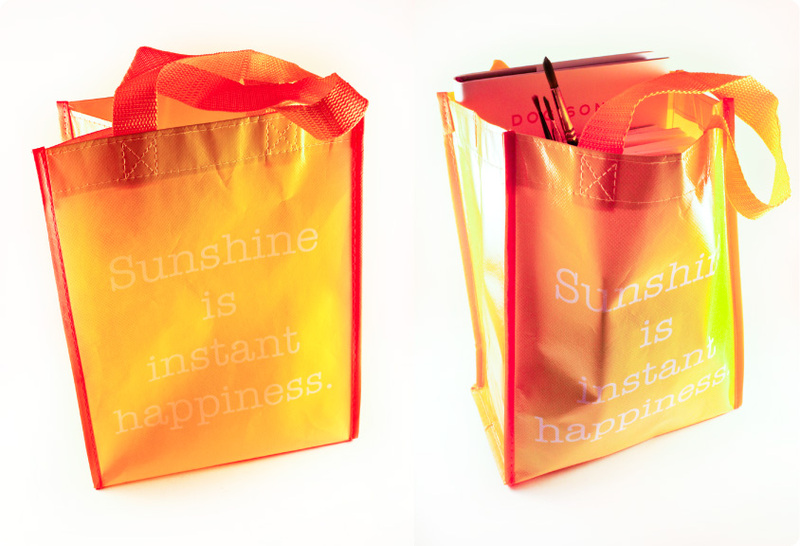 So, I picked up a small $1.50 bright yellow shopping tote that says, “Sunshine is instant happiness”, and I’m going to fill it with whatever it takes to make my days brighter. In goes all my art journalling supplies; tips from the movie- Hector & the Search for Happiness; my iPod; family photos; favorite poems; black bean salad recipe; beach glass; chocolate; my Daily Strength for Daily Needs by Mary Wilder Tileston from 1884; favorite family letters; inspiring quotes; a few herbal teas; Persuasion by Jane Austen; my Leatherman utility tool; some spearmint gum – and by this time my bag of sunshine is bulging – the waif has eaten the Big Mac. My hope and joy were with me all the time I just had forgotten that it takes effort to bring sunshine into our days, now I have a bag of it, ready to take with me on my journeys, which is pretty sweet.